Set in the picturesque Turkey’s southwestern Aegean Region, the city of Aydin has witnessed organized human habitations for over 7,000 years. In fact, the very work ‘Aydin‘ roughly refers to ‘lettered, educated, intellectual’, and this might have had to do with the region’s long tryst with human civilization in its flowering form. However beyond etymology, the area with its 22 registered sites (especially around the famed city of Tralleis) is known for archaeological marvels. And this time around, in a preservation project led by the Aydın Museum authorities, the researchers have been able to salvage burial items from a closed chamber, thus providing insight into the cultural scheme of things around 2,000 years back (during the Hellenistic period of the early Roman Empire in late 1st century BC). As for the contents of this burial chamber, the archaeologists were able to confirm three coffins all laid in a rectangle-shaped vault. Suffice it to say, after 2,000 long years the humans remains (pertaining to the bones) were not in a particularly well preserved condition. But what surprised the researchers, entailed the discovery of various extant artifacts that were probably the accompanying burial gifts to the deceased. According to the researchers, till now they have recovered a whopping 37 objects, ranging from cremation boxes, teardrop-shaped bottles to oil lambs. But the ‘piece de resistance’ of the finds arguably relates to the discovery of an intricately designed theatrical mask made of baked clay. And beyond just its fascinating design, the scope of the objects sheds further light on the occupants of the burial chamber. To that end, the researchers believe that at least of the occupants was “interested or involved in theater”. 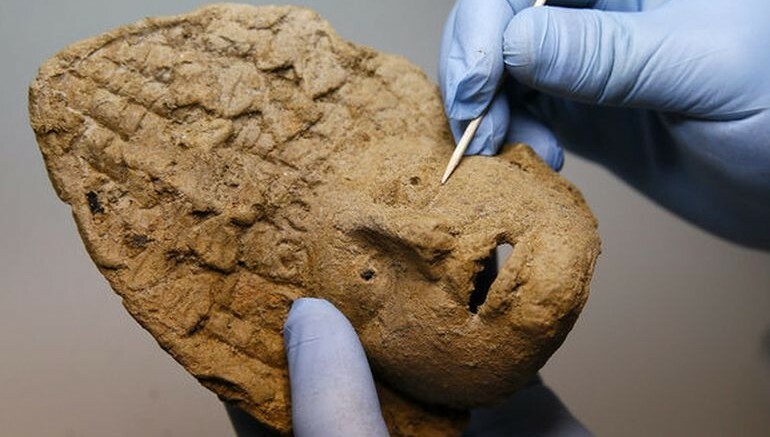 Interestingly enough, archaeologists have never come across any other theatrical mask in the Aydin site. Now the good news is, all of these ancient artifacts will soon be displayed at the Aydın Museum after their conservation procedures are completed by the experts. And finally as for the site of the burial chamber itself, authorities are still to decide its future.